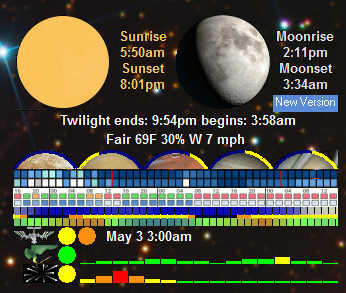 AstroGadgets is a free Windows desktop program for amateur astronomers that gathers information from various astronomy websites, provides a concise display of essential information and provides alerts for events such as International Space Station passes and Planetary KP Index levels (conditions favoring aurora). Current SOHO white light image of the sun. You can position the program anywhere on your desktop by dragging it. To access the menus, use the right mouse button. Added ability to correctly send messages if timezone of PC is different from timezone of site.